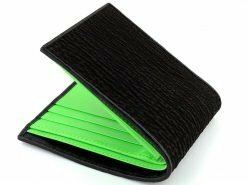 Not your average wallet for men. 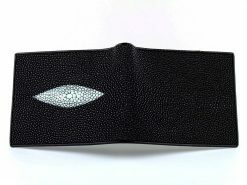 A central band of luscious cream colored eagle ray with it’s “pearl row” created by sanding down the thorns along the ray’s back is flanked by uniquely textured shark leather. 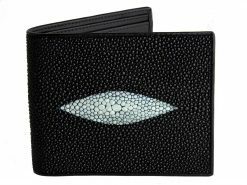 Is it a shark wallet or is it a stingray wallet? you decide. What kind of reaction does your current over stuffed, curly edged, cracked down the spine, cow leather wallet get from your pals? None whatsoever? Thought so. Try pulling out this one and see if anyone can keep quiet about it. 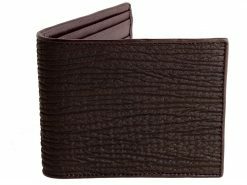 This is an exclusive design by RMW and one of our best selling wallets. I have owned this wallet for a year. I must say it seemed like the stingray was delicate at first and would be easy to scratch, but in all this time it has held up perfectly and still looks great. although i will say the eagle ray material will absorb dyes if you arent careful leading to a mild grey or brown patina. altogether very durable and clean looking. 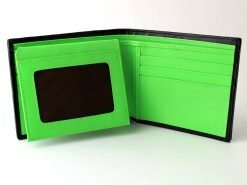 I’ve waited almost two years to write this review, and I must say, this wallet has held up fabulously! Never a loose thread or hole. The shark and stingray have a little rub marks on them, but it is used every day and stays in my Fiance’s back pocket, otherwise it really holds up. Will be buying again for myself! 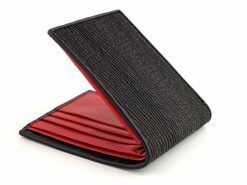 I just wanted to let you know we received my Husband’s wallet in less than one week and in perfect condition! 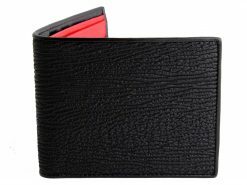 It is a lovely wallet and exactly as pictured and described. Terrific job on your part!! !